The tedious, old-fashioned production of sorghum syrup is rather like an old soldier: it keeps fading away but never dies. In fact, sweet sorghum may be making a comeback. Gardeners and homesteaders know it provides a. tasty substitute for store-bought sweeteners. They also think that sorghum may be a practical cash crop they can grow for a sideline income without loo much competition from big commercial farmers, since harvesting is still a process done pretty much by hand. Now that the IJSDA (at the Agricultural Research Service Food Crops Utilization Research l,al> in V/esiaco, Texas) has found a way to remove starch from sweet sorghum so that it can be made into raw sugar, and not just syrup, small growers are bound to get even more interested. Fa per is say that the United States could replace 30 percent of the sugar it now imports with its own sorghum sugar, once the destarching process is perfected. Gene Logsdon of Ohio grew two rows of sweet sorghum last year, each a lion. 150 feet long, to see how well it would grow in the North. "I'm interested in it strictly as a northern source of sweetening," he explains. "I don't have bees yet, and only two maple trees large enough to tap. I wanted another alternative to buying sugar." Drew Langsner in North Carolina looked more at sorghum's possibilities to add income to his homestead. "We were told that we could make up to 120 gallons of molasses per acre which could be sold direct to customers for as much as SI2 a gallon," lie says. "Moreover, the plant has few insect enemies here and is not critically affected by blights. 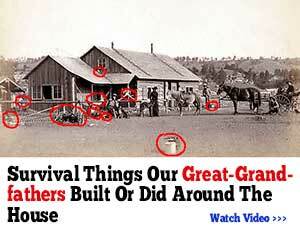 Also, not only do you get the syrup, but the seed heads and leaves can be used for livestock feed." Sorghum is planted the same lime corn is, ab'otit one to two ttu /¡ei deep, itegin i itltnetting right over the iow tifo days after planting, when the weeds are beginning to germinate, hut th, sorghum is riot yd up. were shooting for—three times that amount, Or ii can pwmice a good hit It-ss and sell as low as S.r> per gafton, dejiendtng on supply and demand. But any way you look at ii. wilh a little luck and a nomi. 'd m>p, stvai sorghum ought to gross ;<i least SI,01)1) per acre and tn.tybc ;r> much a.v 52,000 per acre or enough money left over after expenses to repay you fairly well for the hard work involved. The Logsdons didn't know precisely when to harvest their sorghum lor juice, so they relied on advice from Amish farmers who grew it. The farmers said to wait until the seed heads had turned from green to reddish brown, when the seeds are past the milky stage, but still soft. However, the stalks didn't have to be cut immediately at that stage. Any time from then 011 was okay, so long as the harvest was finished before hard frost hit the plants. At any rate, the first harvest step is stripping off the leaves, a job that's more easily clone when the stalks are still standing. Wear gloves and just slide your hands down the stalks, knocking off most of the leaves. It doesn't hurl for the stalks to stand stripped of their leaves for a week. "Stripping the leaves off is drudgery," says !.angsner, "especially when, as in our case, many ol ¡he st.dks have '.diei; over. \Ye bind about haii ihe stripped leaves into bunches 10 dry for winter livestock feed: and the rest we let fall on the ground for mulch." Next, (he stalks are cut and the seed heads tupped off. The l.ogsdons just cut the stalks with a torn knife as they do corn and pile them in bundles beside the row. Then they carry the bundles to the pickup truck, whack off the heads from an entire bundle with one blow of the corn knife, and load the stalks on the truck. The seed heads should he spread out in the barn for drying, then stored for feeding. They need not lie threshed except for grinding; into Hour. Rolling a seed head vigorously between tile palms of your hands will easily thresh out the grains. But the seed heads can be fed directly to chickens, rabbtts, and other livestock. From their half acre, the Langstiers harvested 102 bushels of seed heads—or roughly about 30 bushels of seed. That much nutritional energy bought at the feed store in the form of conventional grains would cast at least §100, so the seed alone may justify the labor involved. Finding a press, if you don't have one, is not as difficult as it might seem, even in the North. They're still around—just keep asking. Gene Logsdon found at least ihrie within easy driving distance of his place, but had you asked him two years ago, he'd have said there were none. Once you haul your stalks to the press, don't worry if the man can't get yours pressed and boiled down right away. The canes can lie two weeks without any noticeable less of juice. 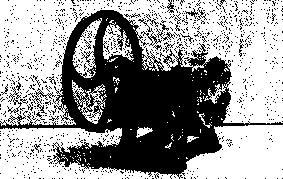 Many presses are now powered with motors, but a surprising number are still turned by horse or tnuk—the animal walks in a wide circle, puiii *g a sweep that turns the gears that make the rollers run. 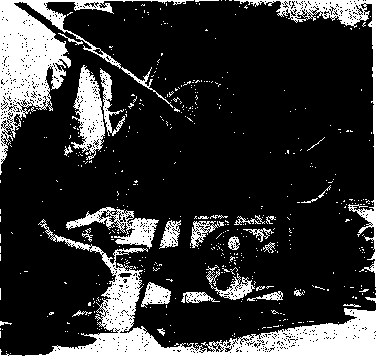 The operator shoves the stalks through the rollers, which squeeze the juice into a waiting barrel through a screen. 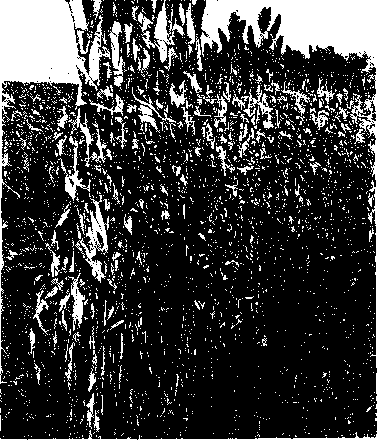 The crushed stalks fall to one side in a pile. They can be used for mulch or composting, or even fed to cattle as silage if laced with some of the syrup skimmings produced during the boiling-down process. A sorghum cooker can be built at home. The farmer who boils the Logsdotis' sorghum made his own cooker—a cement fireplace about eight feet long and two feet wide, with a ten-foot chimney at one end and a roof overhang to protect the cooker from rain. The fire is built near the open end of the fireplace, and the draft pulls the heat evenly under the cooking pan and out the chimney. "The pan can be a very simple affair made of 2-by-8 inch boards for sides and ends and a sheet metal bottom," says one expert, "the whole pan should be about six feet long and two feet wide to fit nicely over the fireplace. Don't use galvanized metal, because the zinc coating on it might react adversely with the acids in the syrup." Employing three rollers to do the squeezing, this unit can be powered by hand or by a i/> h.p. 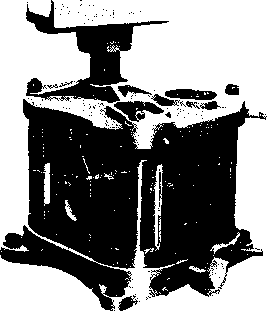 motor for a production capacity of 115 kilograms per hour of cane. CeCoCo also manufactures larger cane mills with capacities ranging from 6 to 15 tons of cane per hour. per hour). Two other units with higher capacities are available—the Karmat and Kamal vertical three-roller crushers. This is a horizontal crusher designed to be operated by a 1 or 5 h.p. motor. It has a crushing capacity of SOU to 1.000 pounds per hour (365 to -155 kilograms per hour). Higher capacity units with three ov live rollers are also available. With crushing capacity of 1.500 to 1,700 kilograms per hour and a juice extracting capacity of 1,300 to 1.600 liters per hour, this machine requires a 5 to 7i/2 h.p. motor to run it. selWfmltng so that the cane does not have to he forced thrcugEi the rollers. Adjustments and maintenance on the 12~> kilogram unit are simple. It has a production capacity ranging be-tvveen 300 and KM) liters per horn.